There are costs and lifestyle considerations to think about when deciding to move or downsize your home. A financial planner can guide you through them. 1.Does Your House Still Fit Your Lifestyle? Do you want to travel the world…spend time with family? Or are you interested in working part-time, going to school or opening a business? Identifying how you want to spend your time now will help you decide where you want to live. Do you expect your kids to return home after they finish school? Are you willing to part with a lot of the personal stuff you’ve collected over the years? If you downsize, you could wind up paying for storage, which can be a hassle and cost hundreds of dollars a month. 3.Do You Want To Own or Rent? When thinking about your next move, consider how and when you need access to funds to cover your retirement expenses. For example, if you will be earning a comfortable retirement income, buying your next home may make sense as it gives you a financial cushion down the road. But, if you need a cash flow boost, renting may let you use the proceeds of the sale of your home to fund your ongoing retirement expenses. 4.How Much Will Moving Really Cost? There are many expenses that come with moving—including closing costs, real estate commissions, land transfer tax and more. Before you bank on using all of the money from the sale of your home to fund your retirement goals, get an understanding of how much the process will cost you, and set aside the funds you’ll need. 5.Will Your Current Home Work Through All Stages of Retirement? Can you imagine being comfortable in your current home when you are 70, 80 or even 90? 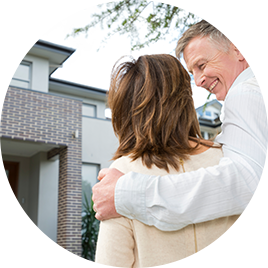 Knowing whether your home will still fit your needs when you are older and possibly not able to drive long distances or climb stairs as easily can help with your decision. See why the need for financial planning doesn’t end once you’re retired.